For projects where minimising the cost of minimising staff costs and other running costs is essential, biomass CHP systems using Organic Rankine Cycle (ORC) turbines fed by biomass boilers, can be an attractive solution. Such systems, while requiring a higher capital cost compared to biomass gasifier based CHP plants, can run largely unattended (if fuel feeding is automated). These maximise uptime and efficiency at a minimised operational and maintenance cost, resulting in a skid-mounted modular machine with plug-and-play connections for convenient installation. 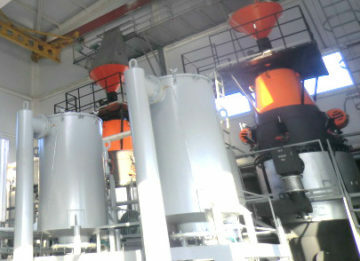 Organic Rankine Cycle (“ORC”) based biomass combined heat and power plants are driven by a biomass boiler that evaporates a special working liquid. This is then used to drive a specially designed expander (turbine) and generate electricity. After the working cycle is finished, the expanded working liquid vapour is delivered to a condenser and then reused in a continuous cycle. Solutions are available to retrofit ORC systems to existing steam boilers or superheated water boilers. In the United Kingdom, ORC based biomass heat and power plants benefit from especially favourable Renewable Heat Incentive (“RHI”) tariffs. Turnkey contracts and financing are available for qualifying project owners. Please contact us for more information on [email protected] or by telephone at +44 (0) 20 3002 0359.